With low running costs - typically less than 10% of the cost of using the equivalant petrol-powered machine, the batteries are extremely efficient and cost effective. This is our 5Ah capacity battery. Recharge time is 75 minutes. 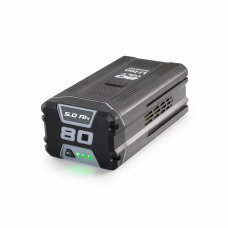 There is also a smaller 2.5Ah and 4Ah batteries available. The battery charger is not included in the price; this can be purchased separately.